Hi you guuuuys!! I LOVE my Kablooie customers. They're stylish and fun and they KNOW what they like - so when I hear back from them, it's just TOTAL happy dance material. Here's a few of the message I've received in the last few months. The only thing more vibrant and joyful than a Kablooie piece is Keneena herself. An amazing woman and an incredible brand. Thanks for creating clothes that stand out and make everybody happy! 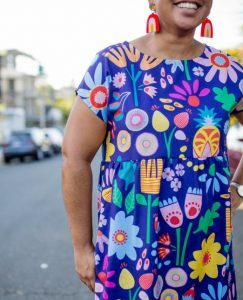 Every time I purchase a vibrant, unique and fabulously handmade product from Keneena, I know that so much joy will be shared with the world. From her quirky designs to her fabulous collaborations with Australian artists, I know that when I wear Kablooie, strangers will stop me in my tracks. Thank you Keneena for making Australian handmade products that inject a whole lotta happiness! I absolutely LOVE my Kablooie dresses not only because the prints are SO MUCH FUN but because they fit sooo well and are beautifully made! Being smaller than the usual size 6, i find it hard to buy dresses that dont swamp me. I was so impressed Keneena was more than happy to size down my dresses to ensure they me perfectly! Thankyou! KA BOOM in our Kablooie!!! I'm that daggy mum that puts her children in matching clothes, so when I saw your most recent release for Girt Squad I knew I had to match us all! It's frigging fabulous!!! We all love our items!! Statement. Colour. Fun. My first purchase and won't be my last! I was SUPER lucky to score a desert peaks dress in Season 3 of Girt Squad - and then waited several months to wear it on my birthday and it was SO worth it. The quality is beautiful, she shape is flattering and it is heaven to wear. Thank you for making my birthday so special. I own 5 wonderful Kablooie products now! The lush skirt, the faces skirt, Aussie birds babydoll, banana for mangoes babydoll and crazy cat lady dress....no.6 is on the way....eyes on you skirt! Needless to say i love kablooie, the quality, the beautiful bright fabrics and the wonderful customer service is all fantastic. I'm hooked and love Kablooie a lot. Buy a kablooie it will change your life! Jenny, this makes me so happy, I’m thrilled that you love your pieces! The fabric is such good quality, crisp and fresh. The colours and patterns that Kaneena choose are amazing. The fits are generous and functional. I am a new mum and I am able to maintain a sense of style and funkiness to my day to day life without compromising on function. The wide opening for the top is great, I can lift my shirt up to breastfeed if I need to! Thank you Kaneena for your amazing fashion! I can’t wait to add to my collections! Bree, I’m so so thrilled by your feedback, that’s exactly what Kablooie is all about - fun fashion that makes you deep down happy! Thank you so much for taking the time to leave such a lovely review! My Lush dress arrived today; am swooning over its lush-i-ness. It is a perfect fit for me; beautifully sewn, and it has POCKETS!! Not only pockets, but pockets of a useable, hold your car keys and your coffee money, and a hankie, size pockets. And the Lush fabric pattern - stunning! What's not to love about clothing that fits and makes one do a happy dance! Annie, you’re wonderful! Thanks so much for leaving a review, so useful for other shoppers and it COMPLETELY made my day! Oh wow, you’ve completely made my day Rhiannon, thank you so much!! Absolutely LOVE my veggie skirt. I get so many compliments on it everytime I wear it! While I do wish it had pockets, it is one of the best quality hand made pieces I own! Thank you Tamzen - you might have seen I have just started adding pockets to all skirts if you ever plan to add another Kablooie skirt to your wardrobe! Love love my cityscape skirt! Already got a bunch of compliments! Comfy and stylish! Oh Helen I'm so happy you love it - great pick! Love my veggie skirt and I can't wait to wear it when I see my clients (I'm a naturopath) and then I can point to the veggies rather than recite my list! Thank you so much Natalie - so glad you love it! Loved reading these? Wanna leave your own review?